Equitours offers a number of adventures where western style riding predominates. Good equitation is much the same for both English or Western riding and experienced riders can quickly adapt from one style to the other. Either way the rider needs to have shoulders and hips centered over the balls of the feet in the stirrup and the hands should be independent of the seat to avoid jerking the horse’s mouth. The classical Western saddle with the horn for roping evolved from the style used in old Spain and came to the Americas with the Conquistadores. 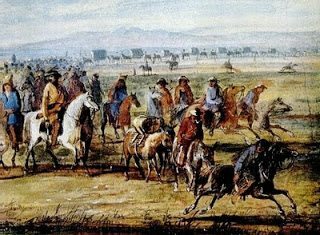 It was acquired in the US West through contacts with Mexican and Californian vaqueros or cowboys. The technique came into wide use in the late 19th century and spread rapidly across the West with the start of the epic cattle drives coming up from Texas to reach the transcontinental railway completed in 1868. These drives also provided stock for the ranchers beginning operations in the Great Plains and Rockies. Western saddles became a vital tool of ranchers throughout the West as cattle began to replace the fast disappearing herds of buffalo. The equipment and saddles used for English and Western riding styles of riding are obviously quite different. English saddles are not built to withstand the strains of roping and tend to be lighter and to offer less security than Western saddles. In Western style riding, the horses are trained to neck rein, leaving one hand free to rope if necessary and to allow the horse to go more independently with less contact on the bit. In working cattle, many cowboys often let the horse use its own natural instincts to get the job done. Horses with any “cow sense” catch on quickly. On rides in Wyoming, Texas and Utah you will find typical Western saddles. You can participate in cattle drives pushing the cows into the high country in the spring and rounding them up again in the fall to drive them to winter pastures in lower country following the old Western tradition. Cattle drives in Arizona and Utah are classical Western rides with 4th generation ranchers offering authentic week-long cattle drives. Trail rides take you through the awe inspiring Canyon de Chelly steeped in ancient Navajo history and culture and make excursions far off the usual tourist path around dramatic Monument Valley, so loved by film makers. Both Wyoming and Utah also offer adventurous wilderness pack trips to remote areas like the Greater Yellowstone Ecosystem and the north rim of the Grand Canyon. Western saddles are also used on pack trips in the Yukon which will take you into a vast, uninhabited land of forests, tundra, glaciers, wolves and bears where you follow trails made by caribou and moose. There is only one resupply by float plane during the ten day trip. The Western saddle with a horn is not widely used in most parts of the world other than in North America, but marvelous exceptions are Western rides in France where you can traverse medieval walled towns, visit old castles and taste the wine in various vineyards. The South American saddles in Chile, Argentina and Uruguay are much like the Western saddle though there is no horn because South Americans traditionally used bolas rather than lassos for cattle as well as wild game. The Gaucho saddles are heavily padded both below and above the tree and have a high cantle and pommel. The soft sheepskin cover on the seat makes it very comfortable for long days of working cattle. Australian cowboys (called stockmen or jackeroos) use a stock saddle like the Western except that again it has no horn and often it has a thigh pads (poleys) to give extra security in the saddle. You will be using this kind of saddle on trail rides in Australia. South African stock saddles are also shaped much like the Western saddle, but also without the horn. They have a high cantle and pommel rather similar to the old McClellan US cavalry saddle. You can find such saddles in Botswana and Namibia where our guests ride out to observe elephant, zebra, wildebeest, lion, cheetah and many other kinds of wild game. "I'm back from the African Explorer, the trip of a lifetime. Please pass my gratitude to everyone at Equitours for making it possible. I took well over 800 photos! Both our stationary stay in South Africa and the mobile safari in Botswana were outstanding."